was a series of exhibitions and creative forums developed to enable a community response to the official APEC conference held in Honolulu in early November 2011. It was the community manifestation of research. We explored the ways in which APEC effects specific local interests, traditional cultural rights to land and resources, and cultural expression. We also worked on proposing reconsiderations of the preservation of cultural and environmental diversity, and the development of new customary/ local/ artisan/ barter/ gift/ and otherwise alternative economies to the current APEC model. The community workshops developed methods of creative demonstration and public address devoted to the real life effects of transnational business. 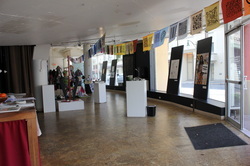 The main alterna APEC exhibition was held at ARTS at Mark's Garage (Nov. 4 - 19, 2011). Local and international artists from around the Pacific region developed creative research projects about Hawaii's local economy. It was co-curated by myself, Noelle Kahanu, and Rich Richardson. The exhibition was reviewed by David Goldberg in the Sunday edition of the Star Bulletin on Nov. 19, 2011. In addition, a solo exhibition of Jeffry Feeger's Port Moresby Market Collection was held at the Hawaiian & Pacific Collections, University of Hawai‘i Hamilton Library, (Nov. 1­–14), with an artist walk–through and lecture/ with reception on Monday, November 7 @ Noon-1:30 p.m.
Feeger, who works in Port Moresby, has become part of a new generation of PNG artists whose work provokes critical awareness about social and political realities in PNG. In 2009 he was awarded the inaugural Tautai Contemporary Pacific Arts Trust and Pacific Cooperation Foundation Artist Residency in Auckland, Aotearoa/New Zealand, and has exhibited extensively throughout the Pacific Island region. His exhibition Port Moresby Market Collection is a visual exploration of evolving grassroot economies and neighborhood markets of Port Moresby. Feeger also did two painting performances while he was here. One for students at Iolani elementary School and one hosted by Pac Pacific Association at Hale Hallawai, East West Center Rd. On November 13th. Feeger uses music and live models to create an expressionistic portrait in a matter of hours. The keynote speech was given by the YES MEN on Nov. 4th at ARTS at Marks. It was aired on Olelo community television throughout November. 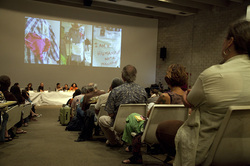 The main forum was held November 6, 5 – 7 pm @ University of Hawaii at Manoa, ART auditorium. Local produce was contributed by Ma'o Farms. These artists and filmmakers from around the region spoke about how their art researches and responds to the human and social effects of the regional economy and its history. The forum was aired on Olelo community television throughout the month of November. As part of the alterna APEC project, involved a series of creative works from artists and young filmmakers who were interested in developing a community response to APEC. Eating in Public created an information brochure about APEC. Available here as a PDF document. Filmmaker Henry Mochida created a film on Eating in Public for the forum. Available for view here. The UH Urban Studies, Spaces of Hope graduate students Molly Chlebnikow, Vera Zambonelli, Stacy Peters and Yanjun Cai, to develop a film about the Honolulu community response to APEC. Available for viewing here. Community workshops were run by [OFF]HRS/Creative to explore what APEC does as a “regional-global” economic structure. Mike Bonnano of the YES MEN also ran a YES LAB on Nov. 5th to help generate conversation on the purpose of APEC and to develop a community response to global corporate economic cooperation. Through the YES LAB, we ended up collaborating with local singer Makana, who was set to play at the APEC world Leaders Dinner. He designed an occupy with aloha shirt and wore while he sang a protest song specially written for the Occupy movement at the dinner. We managed to record it, interview him and send out an international press release the next day. Coverage of the events can be found at http://www.yeslab.org/APEC. In sum, the workshops, exhibition, and forum offered representations of how economic arrangements such as APEC affect us everyday. Local and internationally recognized artists and scholars will offer some explorations and possibilities for a viable ethical, culturally, and environmentally sustainable relationships in the Asia-Pacific economic community. Despite being comprised of specific entities within specific borders, around a [s]Pacific ocean, APEC is hard to locate in terms of its impact on our everyday lives. Its representatives are corporate heads and policy makers from 21 “Pacific Rim member economies,” who make recommendations for their governments on trade policies, environmental guidelines and more. But where are these policies evident to the average person? This salon style discussion led by Nandita Sharma will focus on where and how APEC’s presence is felt. What does it mean to demonstrate? Does it simply mean to Protest? Lead by Example? Or is it more than that? Eating in Public and Mary Babcock will demonstrate art’s useful and active intervention in economic structures such as APEC, as they impinge on all aspects of our lives. Bring your old T-shirts for the print DEMO, sewing needles, paintbrushes, and any other demo tools you can think of. The Yes Men will lead us all in the final preparations for alterna*APEC, taking place Nov. 6th. Limited space. For attendees and contributors to our previous workshops.